Animals accumulate ammonia, urea, uric acid, carbon dioxide, water and ions like Na+, K+, Cl-, phosphate, sulphate, etc., either by metabolic activities or by other means like excess ingestion. These substances have to be removed totally or partially. The process of removal of these harmful substances is called excretion. Ammonotelism: Ammonia is the most toxic form and requires large amount of water for its elimination. The process of excreting ammonia is called Ammonotelism. Many bony fishes, aquatic amphibians and aquatic insects are ammonotelic in nature. Ammonia, as it is readily soluble, is generally excreted by diffusion across body surfaces or through gill surfaces (in fish) as ammonium ions. Kidneys do not play any significant role in its removal. Ureotelism: Terrestrial adaptation necessitated the production of lesser toxic nitrogenous wastes like urea nd uric acid for conservation of water. Mammals, many terrestrial amphibians and marine fishes mainly excrete urea and are called ureotelic animals. Ammonia produced by metabolism is converted into urea in the liver of these animals and released into the blood which is filtered an excreted out by the kidneys. Some amount of urea may be retained in the kidney matrix of some of these animals to maintain a desired osmolarity. Uricotelism: Reptiles, birds, land snails and insects excrete nitrogenous wastes as uric acid in the form of pellet or paste with a minimum loss of water. Such animals are called uricotelic animals. Protonephridia or flame cells are the excretory structures in Platyhelminthes (Flatworms, e.g., Planaria), rotifers, some annelids and the cephalochordate – Amphioxus. Protonephridia are primarily concerned with ionic and fluid volume regulation, i.e., osmoregulation. Nephridia are the tubular excretory structures of earthworms and other annelids. Nephridia help to remove nitrogenous wastes and maintain a fluid and ionic balance. Shape & Size: Kidneys are reddish brown, bean shaped structures situated between the levels of last thoracic and third lumbar vertebra close to the dorsal inner wall of the abdominal cavity. Each kidney of an adult human measures 10-12 cm in length, 5-7 cm in width, 2-3 cm in thickness with an average weight of 120- 170 g.
Structure: Towards the centre of the inner concave surface of the kidney is a notch called hilum through which ureter, blood vessels and nerves enter. Inner Structure: Inner to the hilum is a broad funnel shaped space called the renal pelvis with projections called calyces. The outer layer of kidney is a tough capsule. Inside the kidney, there are two zones, an outer cortex and an inner medulla. The medulla is divided into a few conical masses (medullary pyramids) projecting into the calyces (sing. : calyx). The cortex extends in between the medullary pyramids as renal columns called Columns of Bertini. Nephrons: Each kidney has nearly one million complex tubular structures called nephrons, which are the functional units. Each nephron has two parts – the glomerulus and the renal tubule. Glomerulus: Glomerulus is a tuft of capillaries formed by the afferent arteriole – a fine branch of renal artery. Blood from the glomerulus is carried away by an efferent arteriole. 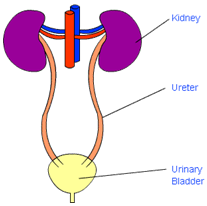 The renal tubule begins with a double walled cup-like structure called Bowman’s capsule, which encloses the glomerulus. Glomerulus alongwith Bowman’s capsule, is called the malpighian body or renal corpuscle. Tubules: The tubule continues further to form a highly coiled network – proximal convoluted tubule (PCT). A hairpin shaped Henle’s loop is the next part of the tubule which has a descending and an ascending limb. The ascending limb continues as another highly coiled tubular region called distal convoluted tubule (DCT). The DCTs of many nephrons open into a straight tube called collecting duct, many of which converge and open into the renal pelvis through medullary pyramids in the calyces. The Malpighian corpuscle, PCT and DCT of the nephron are situated in the cortical region of the kidney whereas the loop of Henle dips into the medulla. Cortical Nephrons: In majority of nephrons, the loop of Henle is too short and extends only very little into the medulla. Such nephrons are called cortical nephrons. Medullary Nephrons: In some of the nephrons, the loop of Henle is very long and runs deep into the medulla. These nephrons are called juxta medullary nephrons. Vasa Recta: The efferent arteriole emerging from the glomerulus forms a fine capillary network around the renal tubule called the peritubular capillaries. A minute vessel of this network runs parallel to the Henle’s loop forming a ‘U’ shaped vasa recta. Vasa recta is absent or highly reduced in cortical nephrons.